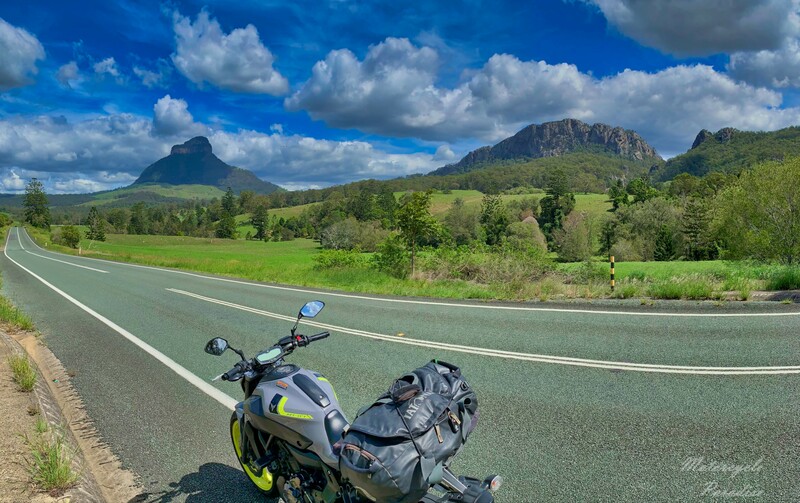 The New England Highlands is a region in Australia full of dramatic landscapes, interesting history and great riding. 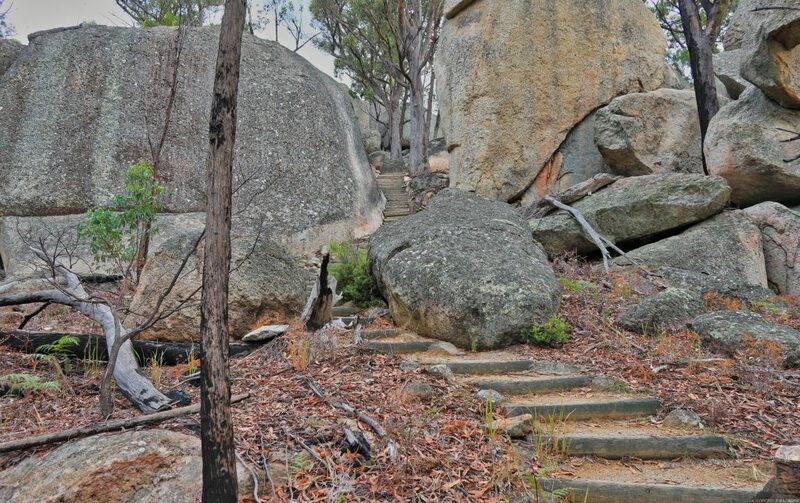 Whilst travelling downunder I took an opportunity to revisit this area. Initially visiting my home town Brisbane did not include a ride. I ended up with a few spare days so thought I’d get a bike and reminisce my old Sunday rides. However a mate insisted we get away so I threw together an idea to ride the highlands, a region I previously enjoyed and had been reading about via the excellent site My Favourite Corner. I hired again from Rent This Bike. 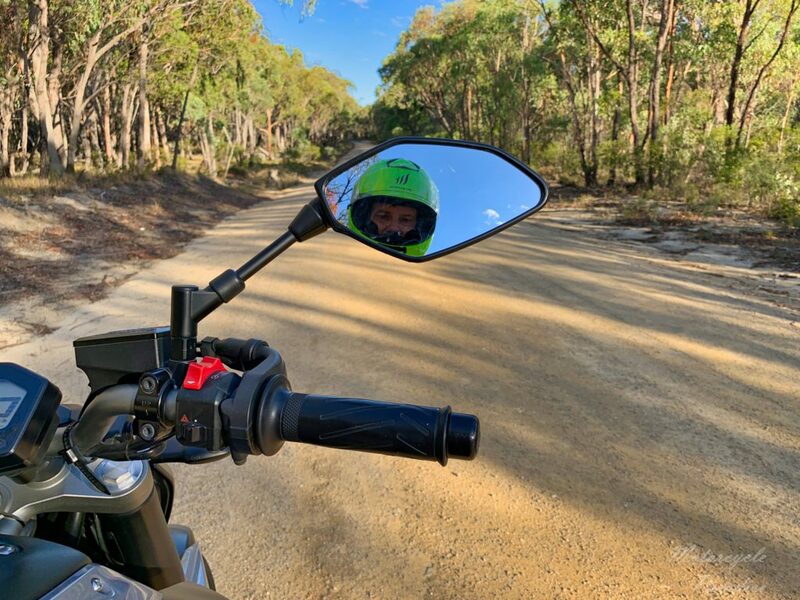 Everything in Australia is in a bubble so I could not justify the raised price for the BMW G650 I had last time instead settling on a Kawasaki 300cc model. As luck would have it I was upgraded to a MT-07, a bike I long have been curious to ride. An early start next morning riding west alone, my mate cancelled. No worries, I like riding solo best and had doubted his Ducati with low clip on bars would tour well. Brisbane is such small town to me now, so easy to ride out of compared to big cities I have been to. 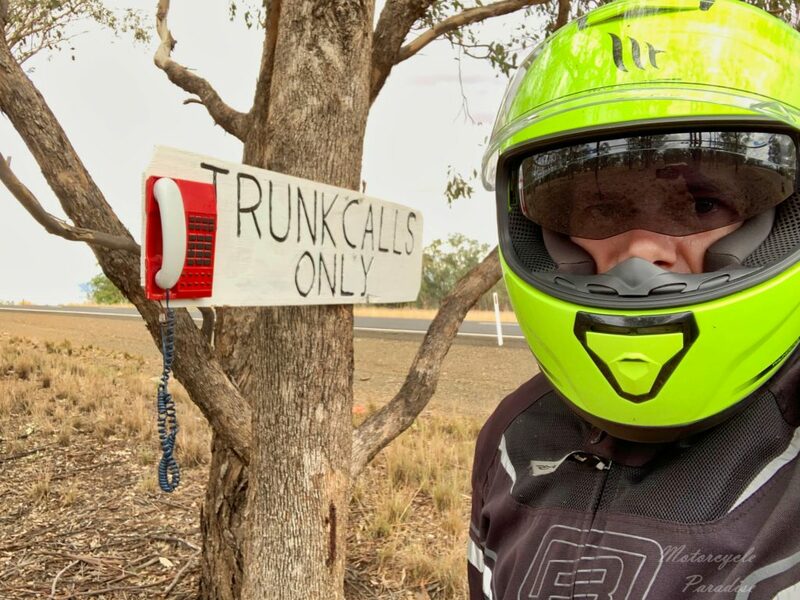 In no time I am back at my favourite spot to launch any ride from. 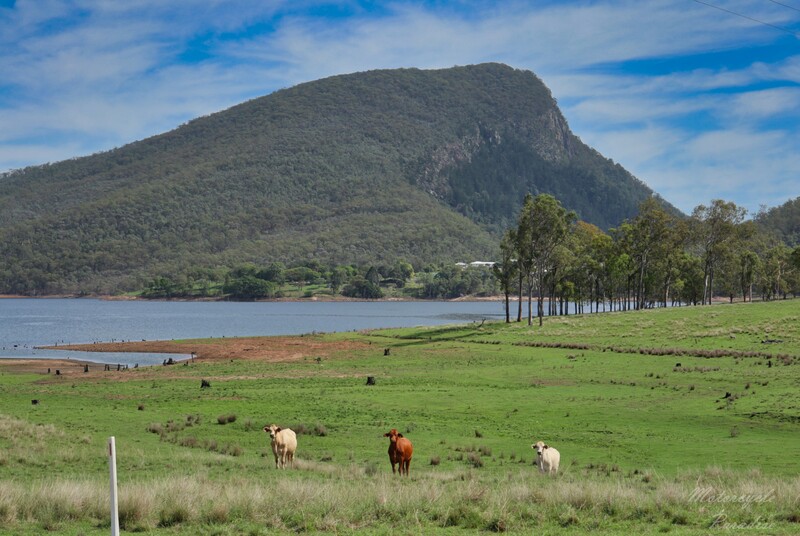 Lake Moogerah. I often imagined taking a photo at this spot when passing the Maroon school but never had the right weather. Until today. With such clear air I stopped to frame the spectacular approach to Mount Lindsey (below). 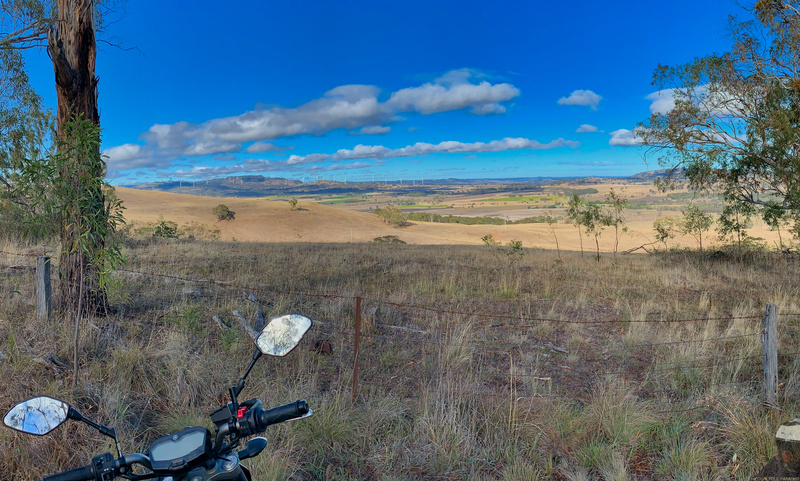 Just using a iPhone Xr for most photos this ride. I have a camera with me but difficult to get to for these quick shots. 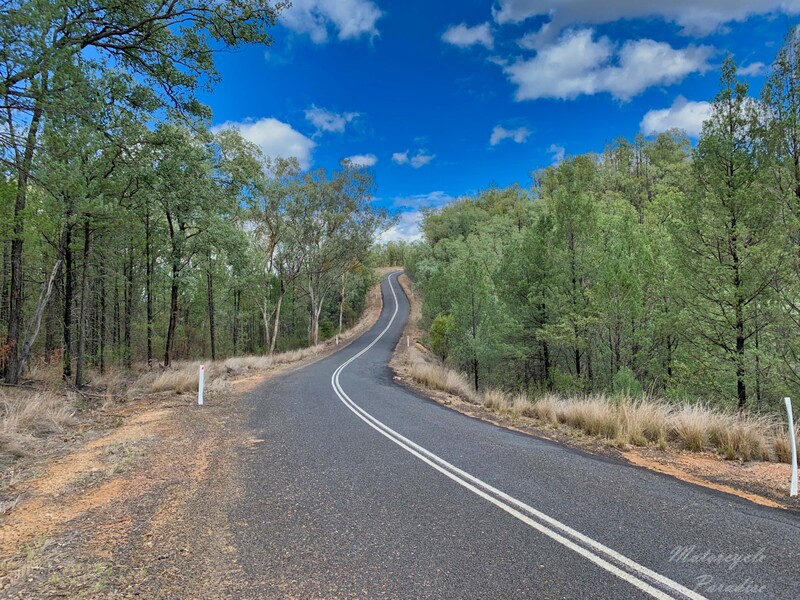 Despite this good section of tar I have to agree with what Chillertek wrote on his blog about the roads in SE QLD – many have deteriorated from where they were few years ago. 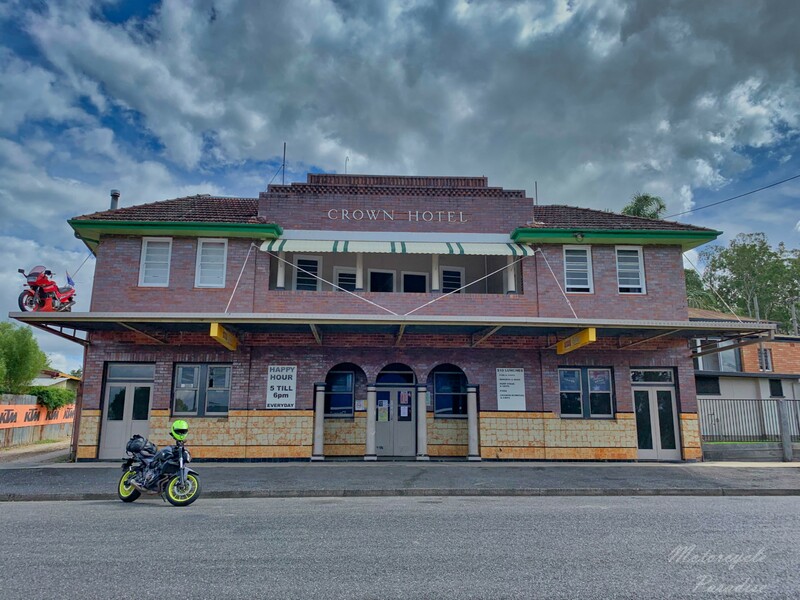 I went to try Lynda’s pit stop at Woodenbong but it was closed as was the Crown hotel in Urbenville. Not much traffic out this way. Never mind, quick bite today is better than a counter lunch as I lost an hour crossing the border due to daylight saving. Nice view looking back but I better hustle south to Old Bonalbo. First time to be riding without a GPS as I know all these roads but been long enough that they feel fresh. The bumpy ride continued but this route was never smooth. 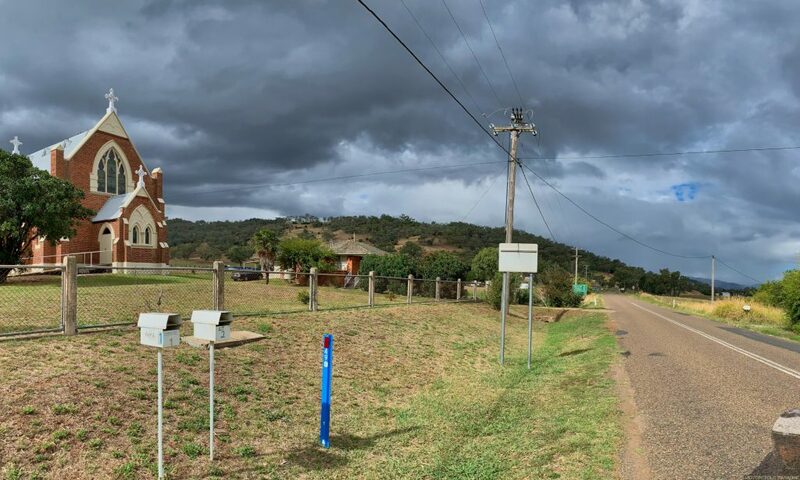 The Bruxner highway came up soon enough and I took a break noting the skies closing in behind me but forecast was fine inland, albeit cold. 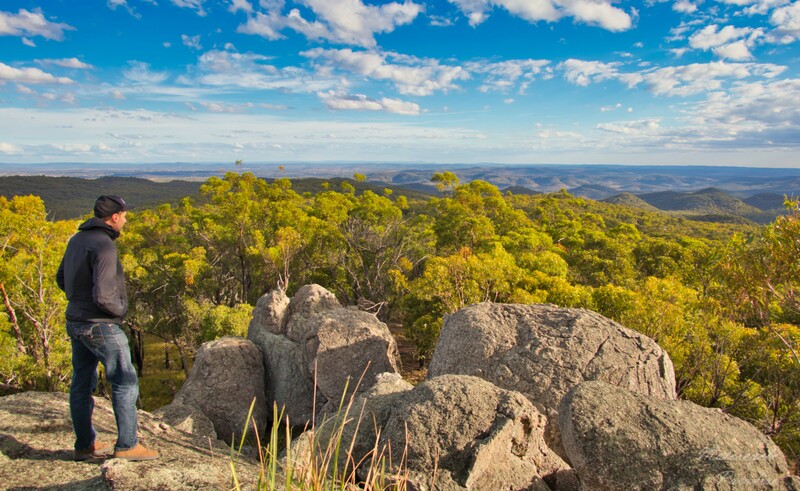 By the time I arrived Tenterfield I needed to add additional layers. I just rented a helmet and jacket and being a Brisbane business where there is no winter only mesh jackets available. But I had the windbreak liner in and had a fleece mid layer under this and then could put my spray jacket over the all that if needed and rode south in 17 degrees to the first feature destination of this ride – Thunderbolts Lookout located at Torrington. 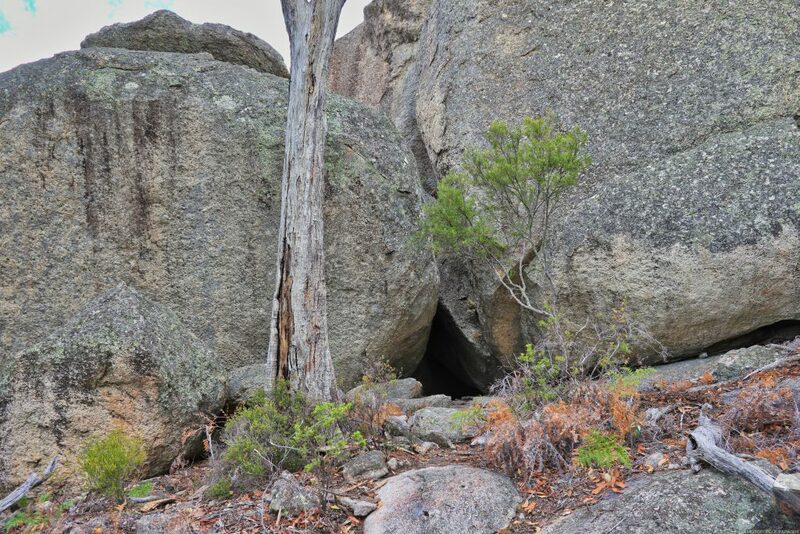 There is a little bit of unsealed road to enter the national park then a 800m walk to the base. 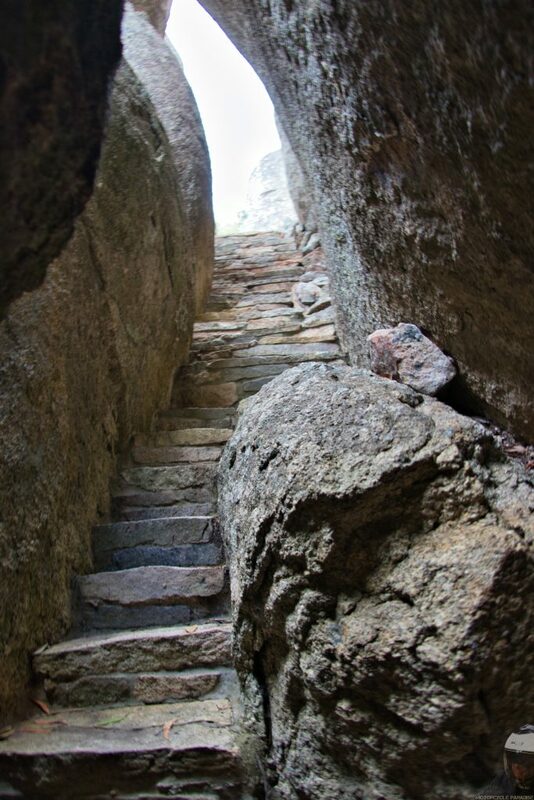 From there you have a Indiana Jones/Tombraider adventure via a path between huge boulders then via a cave to stone steps then up a ladder. Captain Thunderbolt (alias Fred Ward) was a bushranger (outlaw) who roamed from here south robbing stage coaches and in various shoot outs with the law. Wanted dead or alive he like other outlaws used their knowledge of the bush and high vantage points to stay one step in front of the special deputies (bounty hunters) that sought them. I was enjoying the superb vista yet mindful the light was going and there was still some way to go so made my way back to the bike in a brisk hike and set off. But actually I was already out too late and Skippy was awake from his daily siesta. The sun reappeared but by the time I was rolling there were kangaroos everywhere. No choice but to ride on at a slow pace with brakes covered and hope for the best. The unsealed road was nice surface so I could devote all my attention on being vigilant for things hopping until the road becomes sealed again. Some great scenery south via Emmaville but I had no time to stop. 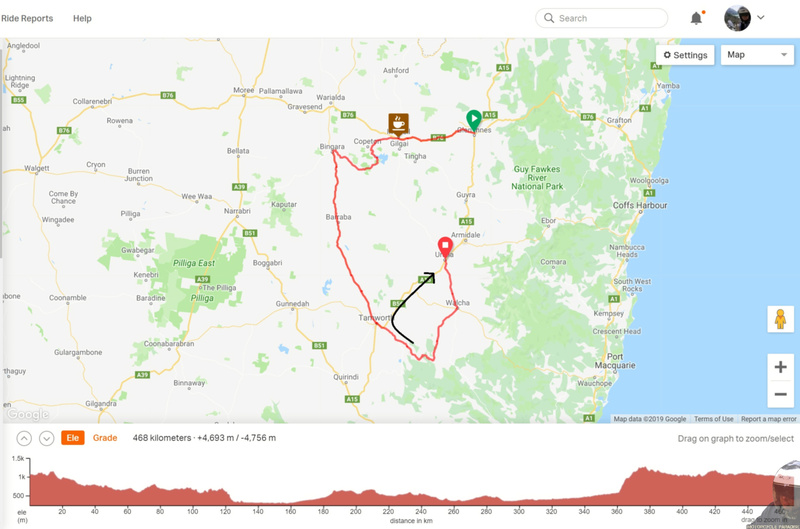 Eventually I entered fenced farm land and the roo’s thinned out so I could bring the speed up and made it into Glen Innes by 5.30pm about an hour later than I had planned only then realising it was 6.30pm local time. Never having had daylight saving where I live I don’t get it, the sun is in same position regardless where you put the hands on the clock. But I digress. My accommodation for tonight. Off street parking for the bike round back. 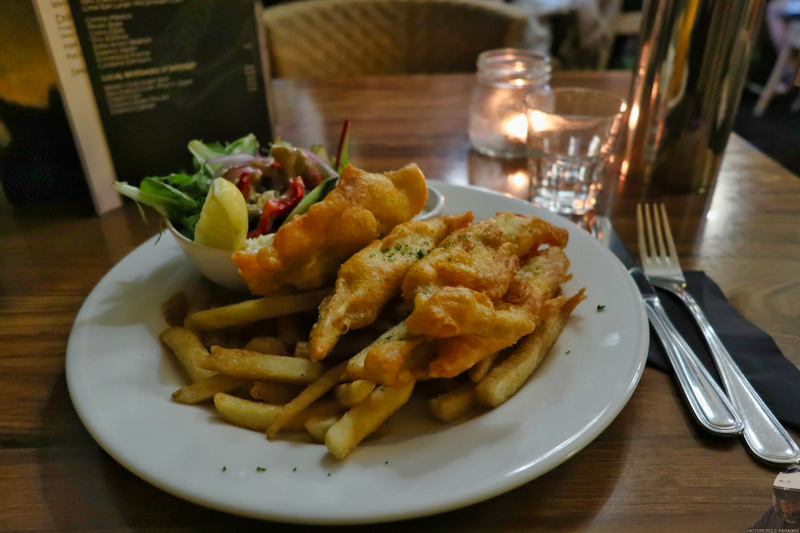 I think when touring Australia staying in historic pubs is the best way and certainly is the best value. Tonight the Great Central hotel. What a top day this has been. 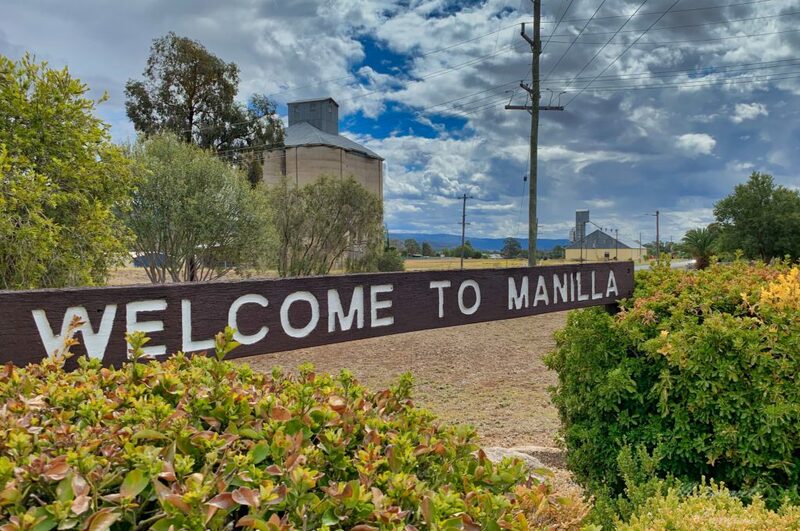 Next morning it was 10 degrees when I set off to Inverell so I put both my jeans on. Don’t laugh it worked. And with one being slim fit and one loose fit was also easy. Fortunately I had packed a few essentials. Two pairs of my Alpinestars boot socks which are supremely good at insulating lower legs. Two technical base layer shirts, one being a Uniqlo heat-tech shirt which I donned this morning. My Held gloves and a new buff. This gear made all the difference. Again I layered up and using my spray jacket as well as the jacket liner had no wind leaks ending up warmer than I have been in better gear. By the time I sat down for coffee at Inverall the morning chill was gone and my gear was too warm. 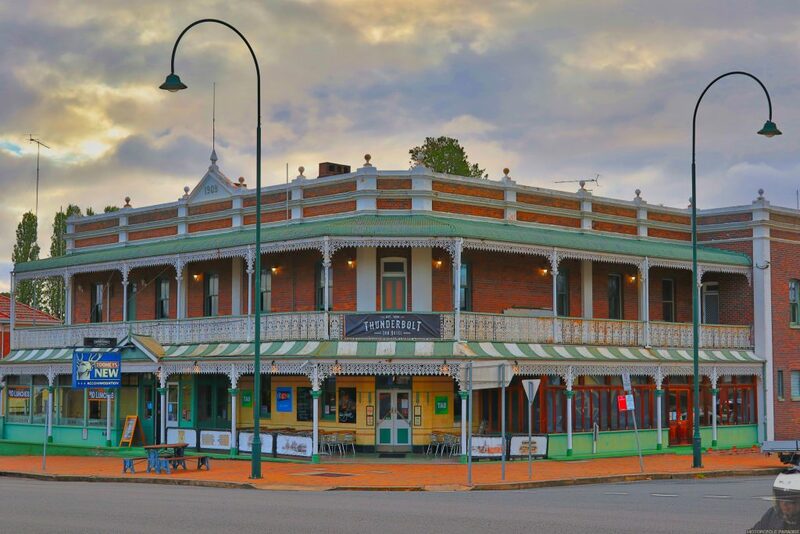 Inverell is a beautiful town in this region with lots of history. I had been thinking to stay here last night and will certainly make this a place I explore more next time in this region. A 105mm German Howitzer captured in 1918 by the Australian 33rd battalion. My bag kept sliding on the miniscule MT-07 rear seat so I stopped at Bunnings to get some antislip matting. I discovered how great this stuff was back in 2006 with same issue on my then Brutale. A bonus is the matting protects your bike from any scuff marks too. 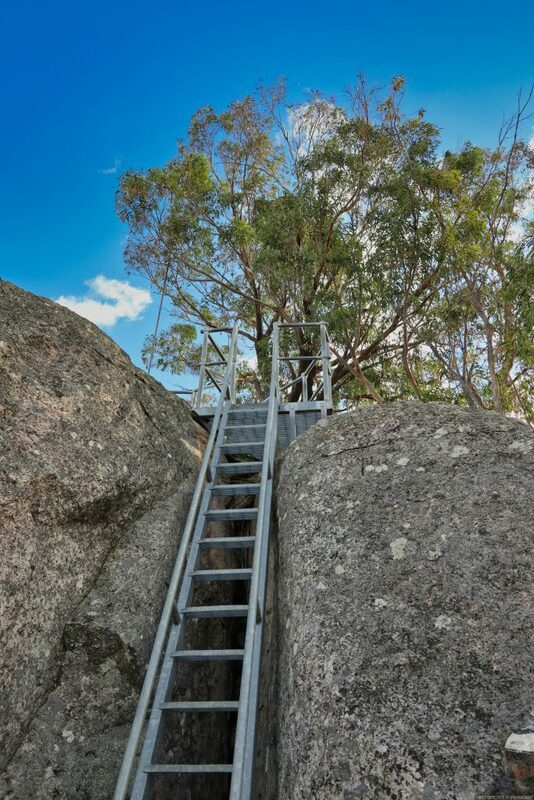 With this done I rode up the lookout west of town but facing east into the sun the photos are not worth sharing. 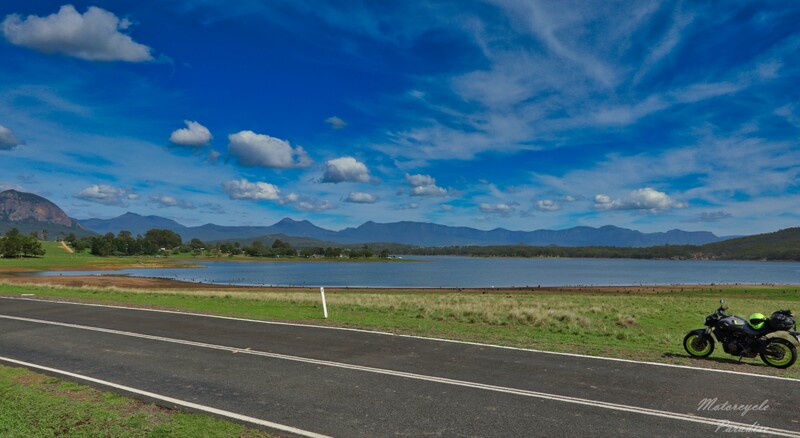 The Copeton dam road to Bingara however is something I want to share, this is a fantastic ride. 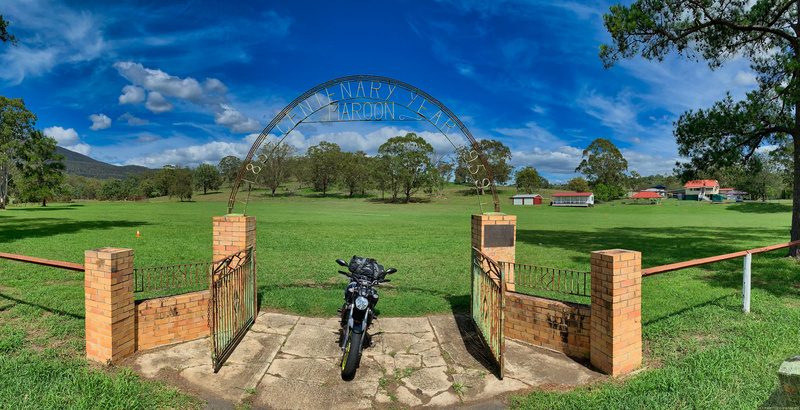 I am adding it to my best motorcycle roads map and will pop it into the sites road archive also. 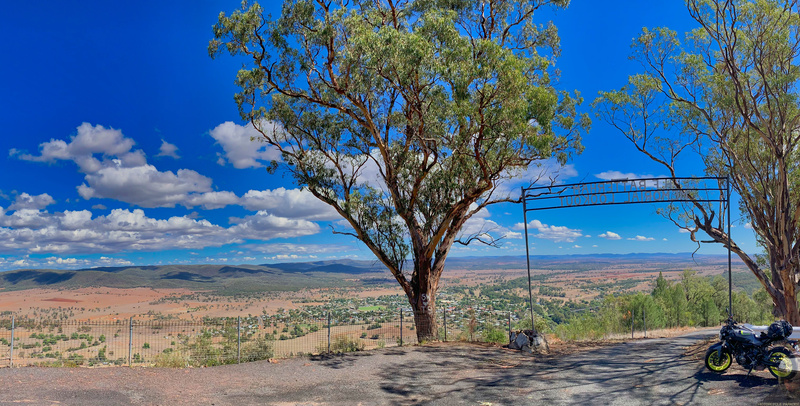 Before reaching Bingara I came across the HF Batterham Memorial Lookout (dedicated to local historian) the view from here is indeed grand, far better than my photography can convey. I was struck at how similar Australia and South Africa look with these vast red soil plains and ancient hills. Look at those big skies. Awesome! 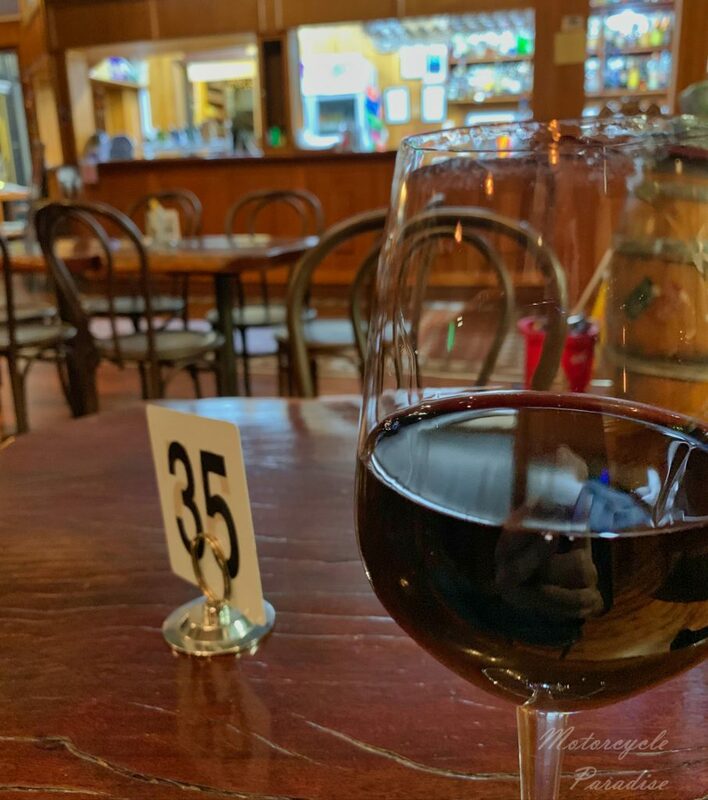 I had lunch at the old Peters milk bar (cafe) at Bingara that I had wanted to see inside last time I stayed here. Nice 50’s interior but I encountered some poor service, YMMV. These telegraph poles are all that remains of the Tamworth to Barraba rail that opened in 1908. Aussie humour, you need to be certain age to get this. 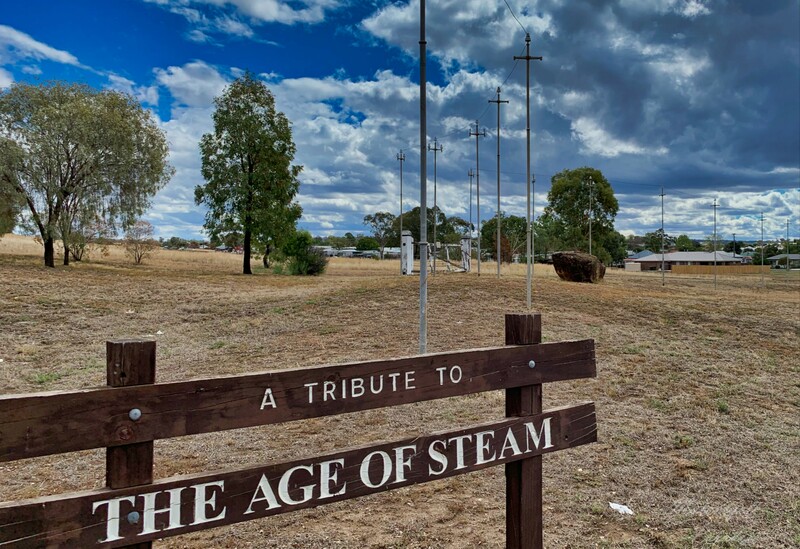 I went to look if any of the Barraba line still existed in Manilla (being an ex rail guy) but very little left. 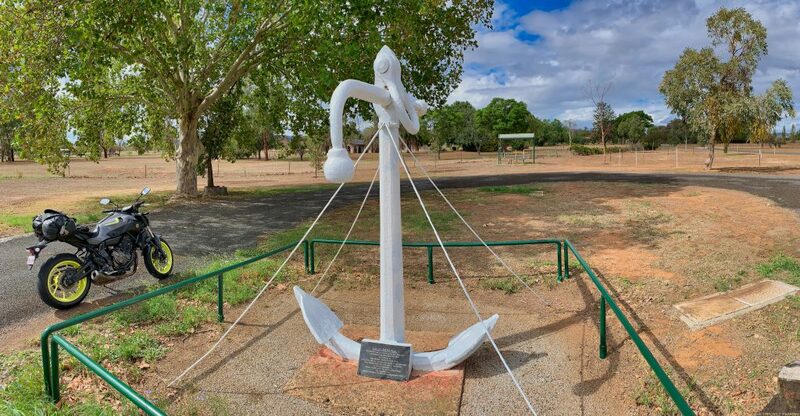 The anchor from HMRN Sealark a memorial to Lieutenant John Oxley, explorer, scientist and the bloke Australia’s best motorcycle road is named after. But this trip I am not riding it. Instead I want to revisit the Uganbil road to Niangala then on into Walcha. I had travelled some of this many years back and it was very scenic. Google street view seems to suggest it might be all sealed now. 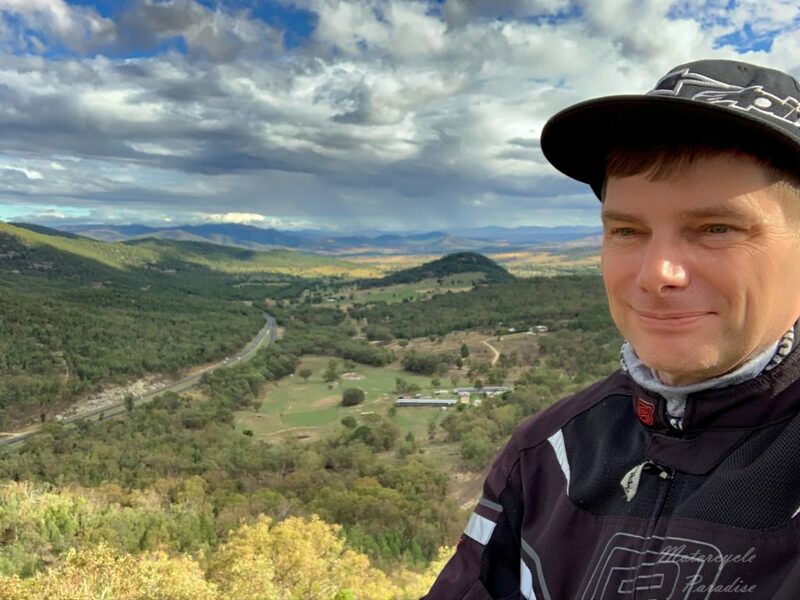 Tamworth for a regional town had some really heavy traffic, I ended up skipping and riding on to Dungowan where alas I spotted rain on the mountains ahead. I debated waiting it out awhile at the local rural pub. 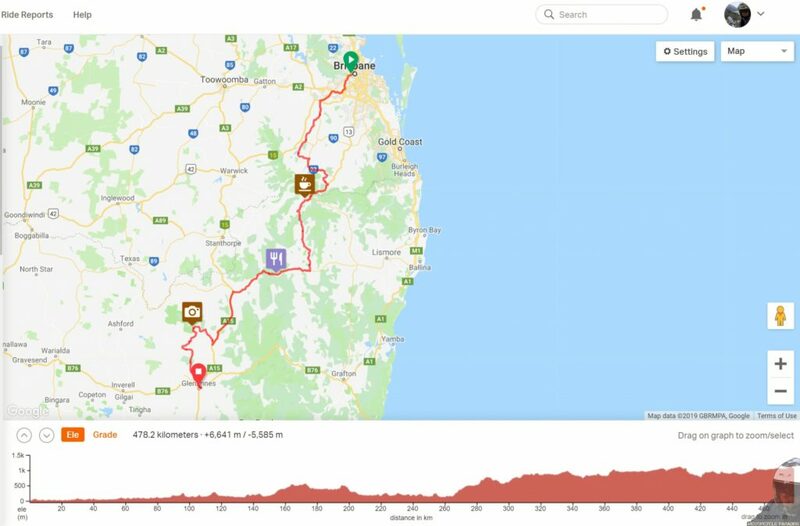 I had ridden this far south specifically to explore this area but the kangaroos might get me if I delayed as would wind up riding unfenced roads in the danger zone. When the first drops reached me I decided to turn around and spun the little 700cc up to out run the rain. What a fun machine these MT-07’s are. 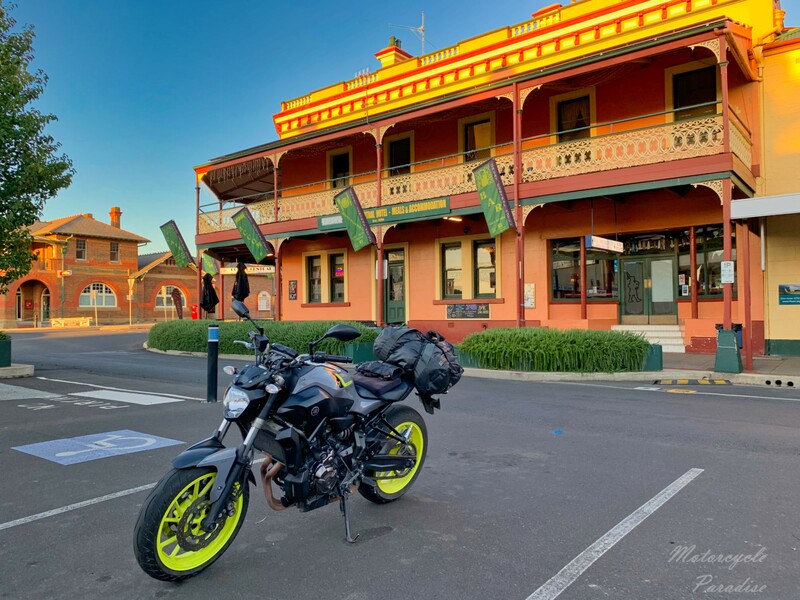 I am staying at the Top Pub in Uralla tonight even though temptation was there to try the beautiful Thunderbolt Hotel (above) and continue the bushranger theme. 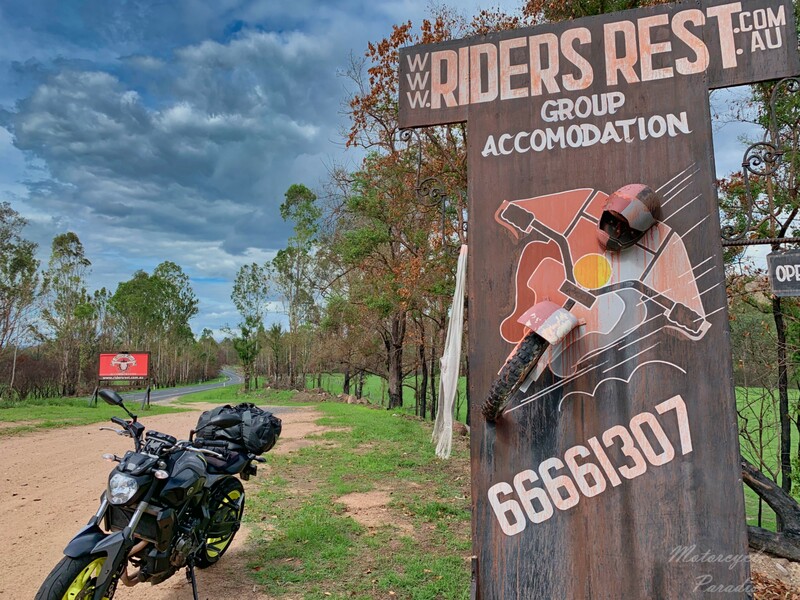 Used to be $25 a night now its $50 but for an ensuite room that is hard to beat in Australia. Well despite missing my target it still has been a fantastic day all the same. My unexpected route change took me past the excellent Moonbi lookout this afternoon and I stayed in front of the rain all the way with it reaching Uralla just on dusk. Truly enjoying this time riding in my home country again. Nice write up Warren. Have enjoyed your blog for a long time. New site looks great. You could havre borrowed my F800 if you had let me know you were in town. Great photos there. It looks like the weathe4 was pretty decent for you too. Also, how hood is that Top Pub in Uralla?! Great food and super friendly staff. I’ve stayed there three times in the last year now. Oh wow thanks, not nearly enough time on the ground this trip, I took the cheapest fare via China which locked me into a very narrow window as Jetstar are highway robbers like Captain Thunderbolt. I shall have to find way to visit more frequently going forward to see family. A lot of those places look familiar, you found the roads to be the same top quality we found them in. 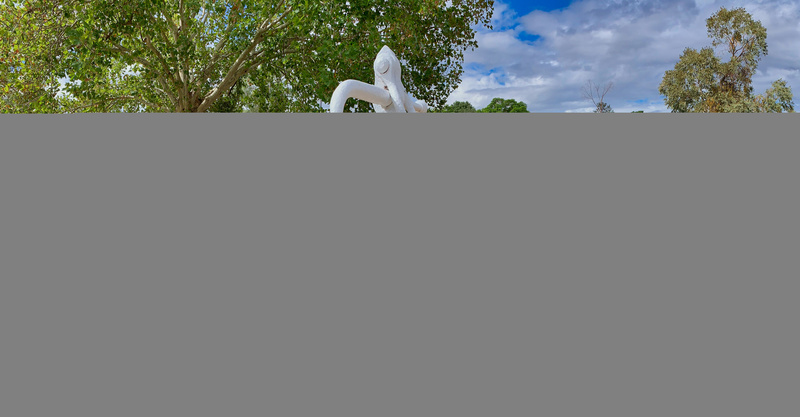 Loving your photo’s Warren and the site is looking good. The thought crossed my mind when I was on the dirt heading to Emmaville that the surface was far better than any of the sealed roads in QLD. Never used to be even half as bumpy as they are at present.